After the bestsellerdom of the Pulitzer Prize-winning Guns, Germs and Steel and the popular Collapse, the talented anthropologist Jared Diamond returns with his long-awaited next book, The World Until Yesterday. But things have to be long-awaited for Diamond, as he doesn’t just keep churning out non-fiction books, but decides on what message he wants to tell and teach to his readers. He also spends a lot of his time lecturing, giving talks, and traveling around the world, as well as most importantly, to New Guinea where he does his research and has been visiting since the 1960s. In The World Until Yesterday, Diamond goes into detail about what a number of traditional societies from around the world do and how they act and react when it comes to things like raising a child, religion, conflict resolution, treatment of the elderly and many other important subjects we all have to deal with in our lives. The traditional groups Diamond focuses on are: New Guinean tribes, Australian tribes, Eurasian tribes, African tribes, North American tribes, and South American tribes. 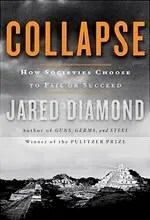 As with his other books, Diamond is not looking to tell the reader what to think or believe, but merely to illustrate what these traditional societies have done for many centuries, and what they continue to do, and what we can possibly learn from this. This includes the subject of child rearing and always keeping the child close in a skin to skin contact in the early years of birth, instead of putting the child in a stroller and away from the parent; or treating the elderly in a more respected manner, than putting them away in elderly care home; or having a detailed system to deal with conflict situations so parties that have suffered harm can be correctly compensated. Again, Diamond is not saying that the first world should adopt all these measures to better their society, but to learn from these and perhaps apply some of the techniques to help improve their lives. 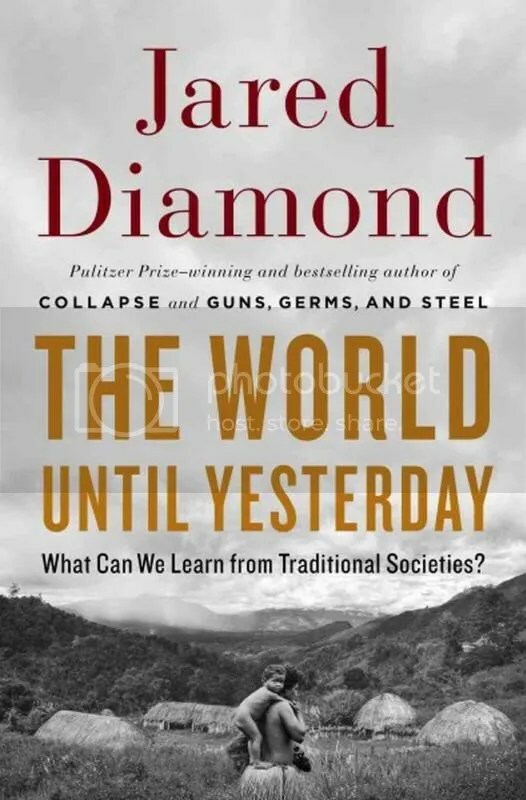 As with any Diamond book, The World Until Yesterday is not an easy read, and takes some long focus and concentration to read through, but at the end of it the reader is filled with a new understanding about the world and how many traditional societies live and breathe in their own lifetimes. Diamond uses a poignant framing device of his boarding a plane in Los Angeles to New Guinea and talks about the world he is about to leave, and the one he is about to enter; and then does the opposite at the end of the book, leaving this traditional society he has become a part of for some time, and returning to the modern one in California. As with any Diamond book, it is an enlightening and fascinating story that is well worth the read. To purchase a copy of The World Until Yesterday from Amazon, and help support BookBanter, click HERE. T. Douglas Price is Weinstein Professor of European Archaeology Emeritus at the University of Wisconsin-Madison and Honorary Professor in the Department of Prehistoric Archaeology at the University of Aarhus, and is the author of Images of the Past, Europe’s First Farmers and Principles of Archaeology. 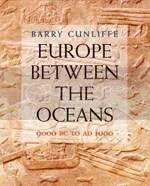 Europe Before Rome is a site by site exploration of a number of stone, bronze and iron age sites throughout Europe. Europe Before Rome begins with a history lesson on early hominids leading up to the prehistoric period and into the stone age. Price uses a number of sites for specific evidence, explaining some of the importance of these sites, but never going into too much detail. After this introductory chapter, there are main chapters on “The Creative Explosion,” “The First Farmers,” “Bronze Age Warriors” and “Centers of Power, Weapons of Iron”; photos are provided, as well as diagrams where possible. Ultimately, Europe Before Rome is more of a text book on these many different sites. Price reveals the important discoveries of many of the sites, but not really in any detail on what affect these artifacts have had on history and their importance. Originally written on March 14, 2013 ©Alex C. Telander. 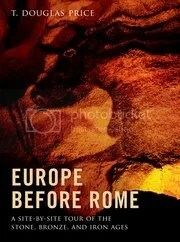 To purchase a copy of Europe Before Rome from Amazon, and help support BookBanter, click HERE. If I were to ask you what you know on the subject of the people that lived in the Americas before the arrival of Columbus and how they got there, you’d likely tell me they came over from Asia during the last ice age and proceeded to populate North, Central and South America in their small numbers and lived a nominal existence, traveling in tribes, forming their small civilizations, such as the Incas, Aztecs and Mayans, which eventually disappeared and then their lives were changed for the better when Columbus arrived in 1492, and brought the western world of civilization to the Americas. Charles C. Mann noted essentially this when he read his son’s history books and saw that the supposed accurate history hadn’t changed since he’d been in high school, which didn’t seem right. And so began years of research and learning that has gone on to change the way the western world sees the history of the Americas pre-Columbus. 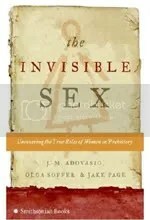 While the book was revolutionary when it was released, went on to win awards and make a lot of “best of” lists, there is still a lot of educating of the world to be done with this true history; hopefully this book will help that cause. 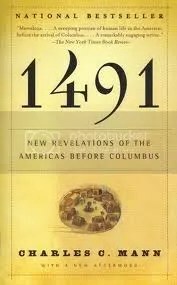 In 1491 Mann seeks to reveal the last thirty years of archaeological and anthropological research and discoveries with the hope that it will change and alter all the commonly held assumptions mentioned above. He does this in a well thought out way, revealing all the evidence and theory on particular subjects, like the whole population of people in the Americas, as well as the sizes and extents of the various empires that formed, and then proving what is the correct one and why, such as the astonishing fact that in 1491 there were likely more people living in the Americas than in Europe! He goes into detail on the Aztec and Mayan civilizations, revealing their true extensiveness and reach and the affect they had on the people, their development and knowledge, and simple things, like why they had invented the wheel but didn’t use it as a means of transportation, because the rocky or jungle terrain made traveling by wheel wouldn’t be inefficient. As to the supposed fact that the peopling of the Americas took place around twelve or thirteen thousand years ago with the Bering Strait land bridge, the evidence says otherwise, with some pointing to the mere existence of the peoples in the Americas before this period, as well as the crucial cutoff date with the end of the ice age not correctly coinciding with the people reaching South America according to the timeline; basically the evidence simply proves otherwise. By the end of the book, the reader has come to the incredible realization that most of what they learned in school about the Americas is completely wrong, and that this supposedly undiscovered continent went on to do amazing things for the rest of the world, such as providing it with three-fifths of the world’s grown goods, including corn (or maize), peppers, potatoes, tomatoes and squash. In fact the term “new world” may have been somewhat of a misnomer, as it seems possible the settling of the Americas may have happened before western civilization. 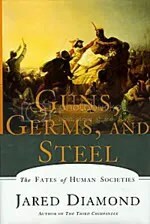 Much as Guns, Germs and Steel was revolutionary in changing our outlook on the way the world is, 1491 has the same affect on how the world views the Americas, what its true history was, the immense effect it had on the world after Columbus, and how the idea that these people were simple and primitive is just ridiculous. The book is by no means an easy read, but once the reader makes it through, the fulfillment is well worthwhile and enlightening to say the least. To purchase a copy of 1491 from Amazon, and help support BookBanter, click HERE. Missing Links was first published in 1981 and caused quite a sensation then with its findings and information, providing an in-depth and chronological coverage of our ancestry spanning millions of years. In this new edition, John Reader has essentially written a whole new book, building on the old edition, updating and providing even more information to make Missing Links so very new and fascinating. John Reader’s work as a writer and photographer for more than fifty years, crossing the globe in his coverage, has led to his appointment as an Honorary Research Fellow in the Department of Anthropology at University College London. The key to this new edition of Missing Links is that it is not just a book of anthropology and archaeology, but also covers the genres of history and biography. The chapter titles run the gamut of our ancestral species, from Neanderthals to Java Man to Piltdown Man to Peking Man; from Australopithecus africanus to Homo habilis to Ardipithecus ramidus. Reader doesn’t simply tell the full story of a particular ancestor, but also provides the latest evidence and science on it, as well as giving the biography of when the first bones of said ancestor were discovered, who was behind the discovery, and how it all happened. Each chapter is its own complete and enriching tale. Originally written on January 24, 2012 ©Alex C. Telander. To purchase a copy of Missing Links from Amazon, and help support BookBanter, click HERE. 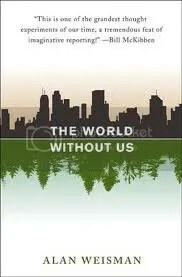 Alan Weisman’s introspective book, The World Without Us, which became a bestseller, seems clear when one sees and reads what’s on the front cover. Yes, it’s a book about the concept of what the world would be like if humanity suddenly disappeared, and how long it would take to recover from the severe imprint we’ve made upon it. But the book is also much more, as Weisman analyzes why we have had this effect on the planet, and to what extent it has reached. After a prelude to why Weisman wanted to write this book, the first chapter discusses Weisman’s journey to the Puszcza Białowieska, a primeval forest located deep within Poland, where life has remained the same for millennia. It is a powerful example of the way the world once was, when humanity hadn’t exacted its harsh footprint upon it. It serves as an introductory signal to the message Weisman is broadcasting in The World Without Us. The various TV documentaries that were made after the success of this book reveal the “world without us” in chronological order, advancing through years, decades and centuries to show the changes, and in this way the subject matter is dramatic and simplified. But the truth is far more complicated, which explains why this book is over three hundred pages long, and not less than fifty. Weisman tells his story, travelling to many places around the world, where he starts with its history and the toll people have had upon it, why it has happened that way, and how this imprint is getting worse. Then humanity miraculously disappears, and Weisman begins the other part of this tale after this unique event, and how it will eventually return back to its once pristine form. Weisman also travels to other locations around that world that have seen little human impression, such as Kingman Reef and the Palmyra Atoll, as well as looking in depth at the Chernobyl site and how nature and wildlife have claimed it back,as well as some of its former inhabitants returning to their former homes. He discusses the Mayan civilization, going into detail with its history and dispelling the common misconceptions as to why it collapsed, explaining the more likely reasons. He performs a detailed study on New York City, revealing everything the city government has to do keep nature at bay from sinking its biological claws into this artificial settlement. Then humanity disappears again and Weisman waxes on nature’s reclamation of this place, as it once was in the early days of the Dutch colony. Towards the end, Weisman comes back to his message, being more overt about it as he wonders on where the future might be headed, as humanity continues to cut away at this planet, widening and worsening a wound that may one day be unable to heal. He talks of the Voluntary Human Extinction Movement, and what effect population limitation would have, if say families would limit themselves to just one child. With the hard fact that a million people are born every four days, it’s a sobering contemplation, as readers now know what the world would do without us, but more important readers get to comprehend what is happening to the world right now with us on it. To purchase a copy of The World Without Us from Amazon, and help support BookBanter, click HERE. One might say that Chris Stringer has had the ideal career that he dreamed of achieving when, at the age of eighteen, he switched his major from medicine to anthropology and was accepted in the PhD program at Bristol University to study Neanderthals. Shortly after graduating he received a job offer at the Paleontology Department at the Natural History Museum in London, where he is still a researcher, and is now one of the world’s foremost paleoanthropologists. 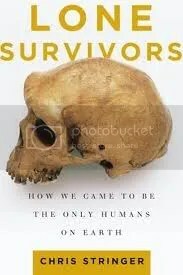 Lone Survivors is the ideal book for any would-be fan of anthropology, wanting to get the latest news and discoveries on our ancient ancestors, as well as the perfect text for one either taking an anthropology course or perhaps contemplating switching majors, much as Stringer did. 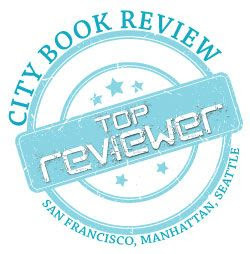 The book is an easy read in that Stringer’s voice is conversational and pleasant, he breaks everything down to its base parts, and shows complex matters in a clear light. He has introductory chapters dedicated to the various methods of archaeology used in studying fossils, as well as dating them. Stringer also skillfully provides constant hints of matters he will be later discussing to entice and keep the reader hooked. By the end of the book the reader will feel well educated and well versed on our ancestors, as well as up to date on the latest findings in the world of anthropology. Originally written on February 3, 2012 ©Alex C. Telander. To purchase a copy of Lone Survivors from Amazon, and help support BookBanter, click HERE. One of the most impressive things about history is that it is never static; you could take one event that is well documented, then come back to it a decade later and find the details and actions and reactions on that event to be totally different. One area where the knowledge and thoughts and ideas of what the period was like that is constantly changing is prehistory; our ancestors who lived before any real form of the written word was invented, other than cave paintings. This is approximately 15,000 to 20,000 years ago, when the last ice age came to a close, and the melting pot that was ancestral humanity – Cro-Magnons and Neanderthals (and perhaps in the future anthropologists and archaeologists will discover another tangent of hominids) – came to a final decision through the evolutionary step of Homo sapiens sapiens. Brian Fagan is the professor emeritus in anthropology at the University of California, Santa Barbara, and the author of The Great Warming, The Little Ice Age, and The Oxford Companion to Archaeology. In Cro-Magnon, Fagan brings readers up to date with all the latest knowledge and evidence on the Cro-Magnons and the Neanderthals. The common perception is that with the end of the ice age, there was the big migration of Cro-Magnons into what would eventually become Europe, as they existed with the Neanderthals, not integrating and living together, but overpowering and superseding them, eventually rendering the Neanderthals extinct. 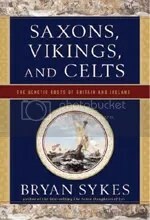 Fagan explores the history of the Neanderthals, discussing and developing ideas and theories of when they migrated into Europe and spread around and how it was quite possible there was coexistence between Neanderthals and Cro-Magnons, with exchanges in trade, habits, tool making, and perhaps even histories. Fagan posits that Neanderthals may not have died out, but become integrated with Cro-Magnons. Fagan then launches into the main part of the book with the Cro-Magnons, and the general labels that are applied to the different periods and developments of Cro-Magnons: Mousterian, Châtelperronian, Aurignancian, Gravettian, Solutrean, and Magdalenian, exploring each label and what makes it individual. At the end of the book the reader is left understanding a lot more about our ancestors, and perhaps coming to the realization that the Neanderthals, and certainly the Cro-Magnons were a lot more intelligent, creative and developed than the idea of the fur-covered man with the spear hunting the woolly mammoth, while the fur-covered woman remains in the cave with the children, tending to the fire. One can’t help but wonder how our knowledge and perceptions of these people may change in ten years time, especially since there is so much more to be learned and discovered; the cave paintings of Grotte de Chauvet, Niaux and Lascaux are merely the tip of the ice berg. Originally written on September 16 2010 ©Alex C. Telander.